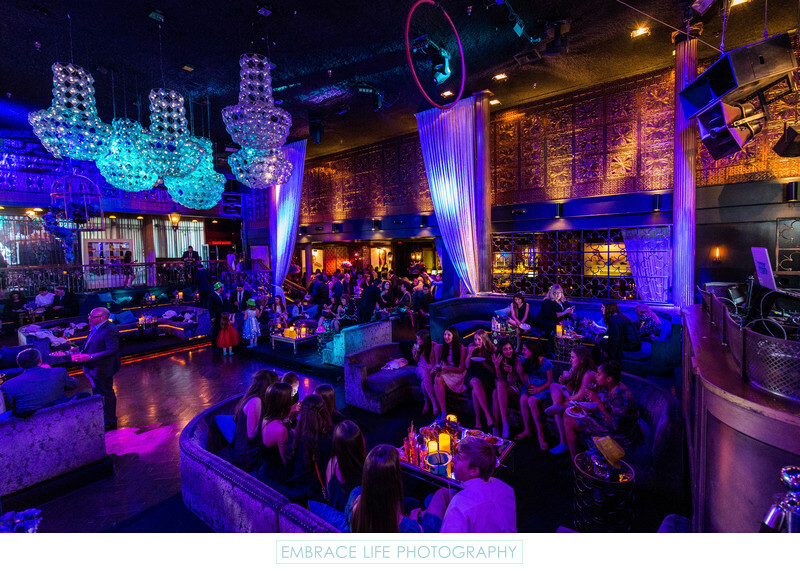 The West Hollywood night club, Greystone Manor, served as the best possible party venue for this glamorous Los Angeles bat mitzvah. Seen here, guests enjoy the abundant space, lounge seating, bar, and buffet area. L.A. event photographers, Embrace Life Photography, captured the creative ambiance of the space including the modern creystal chandeliers, tall curtains, unique walls, amazing event lighting, mirrored tables with warm candle light and purple flower arrangements, the birdcage flower arrangement, the candy bar, and even the large portraits of the bat mitzvah girl that covered the event space's existing artwork. Los Angeles event planner, Ilana Wenger, truly brought the personality and vision of her clients to life. Location: 643 N La Cienega Blvd, Los Angeles, CA 90069. Keywords: Details (1125), Event Photography (384), Mitzvah (78).